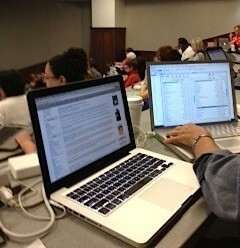 Wrightslaw is live blogging from the Institute of Special Education Advocacy (ISEA) all week. We hope you will join us! Check your state DOE website for forms for due process. You can use these forms – you don’t HAVE to use the forms. Same for state complaints. Each state has to have written state complaint procedures – for filing and resolving complaints. State complaint process is much broader than due process procedures. Complaint copy must be sent to LEA as well. The scope of state complaint issues. educational placement of a child with a disability. OSEP letters and guidance indicate you can initiate systemic complaints as well a substantive (FAPE) complaints. If in due process can’t file state complaint on same issue. 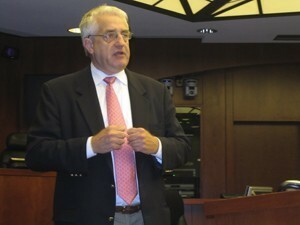 Bill Hurd, partner in the Richmond office of Troutman Sanders who leads the firm’s Appellate Team. The case of the (allegedly) perjured principal. The case of the prosecuted parent. The case of the french fry fracas. The case of the treacherous trespasser. The case of the galloping guideline. IDEA provides parents something quite unique in the law. The right to an individualized program and the right to contest any aspect of the school system’s treatment of a child. Sonja Kerr, Senior Attorney the Public Interest Law Center of Philadelphia and the Law Center’s Director of Disabilities Rights. Wrightslaw has broken the OSEP memo down into the specific components as smaller files. To enforce mediation agreement you cannot go to due process, but can file a state complaint. Due process request letter – first step. What controls the outcome of a complaint? Facts or law? Neither. Pete explains what does. Only one thing controls outcome – whether the HO/ALJ wants to rule in your favor. Prepare for the ultimate event, a due process hearing – a battle of expert witnesses. Assume you will lose and your case will go up on appeal to federal court. Prepare parents for slow process without a quick fix. Persuasion – your focus, your theme, simple and easy to understand. First step for parents – organizing the file. Check the Wrightslaw you tube channel. Have parents organize the file, write letters, keep a paper trail. Empower parents rather than do for them. Perceptions and first impressions are critical. Attempt to be proactive rather than be on the defense. Start by creating a paper trail of documentation of everything. Your letters will tell a story and create visual imagery. Use the Letter to the Stranger format. This training is about the important part advocates play in due process. Prepare. Plan on going to due process. Develop your strategy. Assume every case will go to hearing. Assume every case will be appealed. Assume every case will end up at the US Supreme Court. Discussion of inter-relationship between special education, juvenile justice system, behavior, self-medication (substance abuse). Tips for advocates: initial consultations, what to tell parents, using legal element charts, informing parents of pitfalls. Advocate responsibilities at the pre-attorney stage… and the attorney stage. Post-Winkelman: the good, the bad, the ugly. Short presentations by five attorneys, followed by Q & A. No notes will be published from this session. What would you do to get more meaningful outcomes? You need to know: the child, the client, the law! Who does the school attorney represent? Who can a parent bring to the IEP meeting? Be realistic and open-minded. Ask lots of questions! Ask for research. Write things down to frame the issues – send your letter describing what happened in the meeting asking for a response as to agreement with the issues. (You own PWN of sorts). Marilyn Bartlett, a person who has dyslexia, sued the NY Board of Law Examiners for refusing to provide reasonable accommodations on the bar examination. What is the Bartlett case? Learn more about Marilyn Bartlett and this case. Key difference in 504 and IDEA. No money for school districts (just general funding) under 504. 504 these days. ADA and 504 protections parallel. New ADAAA requirements. Shifting the inquiry in education away from disability. A very broad shape of protections, rejected the burdens imposed by previous court cases. Also protected is “regarded” as having a disability. **Read Rowley! Know the case law and regulations about FAPE provisions in 504 and eligibility. 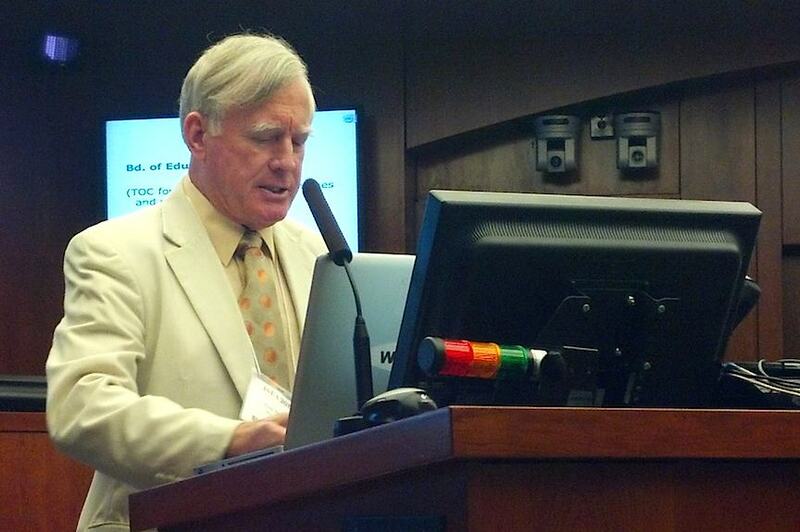 Dr. Harry Gewanter, pediatrician and pediatric rheumatologist. US DOE FAQs about 504. Section 504 does require that school districts provide FAPE. The new listings for major life activities is extensive. If you have a problem that is getting in your way in some fashion, you are potentially eligible. Now much easier to meet the language and the guidance. You don’t have to be affected at the moment. Just because you are doing well now, doesn’t mean condition has gone away. Schools have used this excuse forever. Anyone with a chronic condition would benefit from a 504 plan in place, even though they are doing well at the moment. Accommodations can be across the board. Behavioral, physical, organizational, educational, social, vocational. 504 accommodations can provide a safety net for many students. If something is predictable it is potentially preventable. These workarounds for prevention can go into a 504 plan. Not just a “health plan” but a Section 504 plan that has legal standing. Patty Roberts, Director of Clinical Programs and Supervisor of the PELE Special Education Advocacy Clinic at William and Mary. Child find duty. School’s responsibility. Response to Intervention RTI. Tension with the child find obligation. OSEP memo and RTI and IDEA obligation. Educational diagnosis v medical diagnosis. Suggestions for more effective involvement in eligibility decisions. Eligibility denied – now what? Congress left to states the definition of learning disability. Varies widely across states. Special education advocacy is what you do – it is not who you are. Rule #1 – You can’t fix everything. Rule #2 – You can’t change rule #1. What to do and what to avoid. Tactics, tips, and techniques for advocates. Important issues. How to prepare for the IEP meeting. Basic advocacy tips. Review the Dephi Technique. Facilitated IEPs. Joe Tulman – Director the University of the District of Columbia David A. Clarke School of Law’s (UDC-DCSL) Juvenile and Special Education Law Clinic. The US is the most incarcerated country! 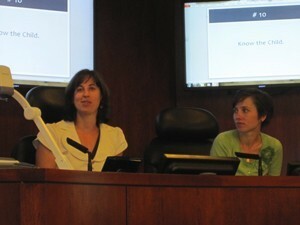 Discussion of special education strategy for change. The negative impact of suspension – it’s counter productive. Other approaches for reversing the school to prison pipeline. Alternatives to juvenile detention. Destroying the incentive to push kids out. Assignment – class work: problem solving strategies (special education and the stages of a delinquency case). Procedural protections for children who have yet to be found eligible. When the school is deemed to have knowledge of a child’s disability. MDR – Required legal process done by the IEP Team. If a manifestation, the disciplinary suspension must end and the behavior must be addressed through the IEP process. Preparing for the MDR – tactics from the trenches. Discussion of special circumstances when MDR is not required. When the behavior is not a manifestation the student is subject to the same discipline as others without a disability (but services continue). with Harry Gewanter – Richmond, Virginia pediatrician and pediatric rheumatologist in private practice and the Associate Medical Director of Medial Home Plus, Inc.
Dr. Gewanter begins with a discussion of what you need to assess about an expert – benefits v. potential conflicts. What you may need to teach your expert. When do I need an expert? Consider the “diagnostic disconnect” – the agreement on the nature and scope of a child’s disability. How an expert works with a special education advocate and forms of expert information. 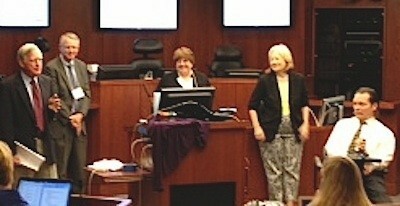 Review of how to prepare an expert for collaboration in a special education case. Joe Tulman, Director the University of the District of Columbia David A. Clarke School of Law’s (UDC-DCSL) Juvenile and Special Education Law Clinic. Behavioral issues and special education eligibility – provision of FAPE. Adverse impart on educational performance: tie the behavioral issues to the disability. Advocates job to get everyone on the same track. Disability categories – you need to know both federal and your state categories. Eligibility and good grades and adverse impact. Behavioral Issues and Section 504 – entitles students to accommodations. If you suspect a disability, you must evaluate. 504 plan – advantages / disadvantages. Supposed to determine the “cause” of the behavior – not all FBAs are “good” ones. Very little guidance about contents FBAs in the regulations. 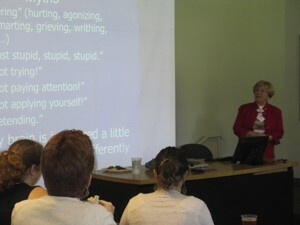 Review of bullying and special education – the bully and/or the victim with an IEP. Jeffrey Breit joins the ISEA Class of 2013 for sessions today. 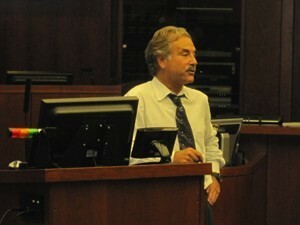 Jeffrey Breit, 2008-2009 St. George Tucker Adjunct Professor of Law and partner at Breit, Drescher, & Imprevento. 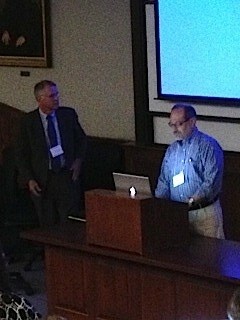 Jeffrey provided the impetus to create the PELE Special Education Advocacy Clinic at William and Mary. Scales of Measurement and terminology. How to request test information? What to request? 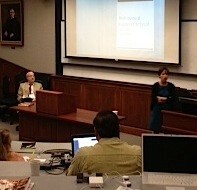 Kayla Bower, Director of the Oklahoma Disability Law Center presents a CLE session on Ethics. What to be aware of – the unauthorized practice of law for advocates. Issues, concerns, pitfalls. What kind of ethics rules are there? Could possibly model the National Federation of Paralegal Associations model code. Find the advocacy agency/attorney in your state at www.ndrn.org. Assignment: Review the leading case in your state re the unauthorized practice of law. Know the case law in your state. Learn the statute/case law/specifics of confidential privilege in your state. “I am a law student/new lawyer/lawyer new to special education. I already know how to analyze case law. Why do I need to review this again?” Pat explains. A basic understanding of case analysis will make advocates more effective is assisting and advising parents who must proceed pro se. Under IDEA, parents have separate rights, independent of the rights of their child, and parents may pursue IDEA claims on their own behalf. Winkelman – Who won? What does it mean? What were the costs? Pro se parents cannot recover their own fees and costs. Subject to monetary sanctions? After Winkelman. What advocates need to know when parents are unable to see the forest for the trees. Lives Worth Living traces the disability rights community as they secured equal civil rights for all people with disabilities. Thanks to their efforts, tens of millions of people’s lives have been changed. and the Law – IDEA 2004. You NEVER forget what it feels like NOT to be included! 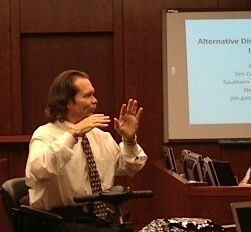 Jim Comstock-Galagan from the Southern Disability Law Center speaks on inclusion. Jim tells his story. What happens when his mother is told, because he is “handicapped,” he cannot attend school with his brothers. He must attend the crippled children’s school across town. As his mother says “no way!” Jim wonders “what does ‘crippled’ mean? The crippled children’s school was not a placement, it was a sentence! The principal explained that Jim had no rights to attend. We are far more alike than we are different. Inclusion matters to everyone. Segregation matters to everyone. Jim shares an inspiring story from Mississippi about a family’s fight to have their daughter included. Equal rights is what the law embodies. Inclusion matters! It is unfortunate that our schools lack empathy. It is our job to bring empathy to schools. Help schools put the issue in the perspective of your client. The law is an extremely effective tool, but it should not be your only one. You need to understand what exclusion means to you, how it hurts you. You need to help others understand how exclusion hurts. Kids are human. Exclusion hurts. Inclusion matters! Patty Roberts, Director of the PELE Special Education Advocacy Clinic opens ISEA 2013. 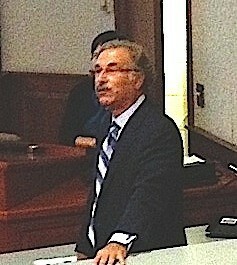 Davison Douglas, Dean of the William and Mary Law School welcomes ISEA Class of 2013. 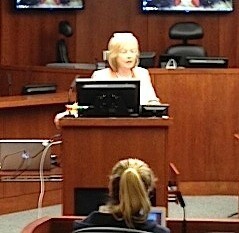 Dean Douglas salutes the class for the work they do in special education advocacy. This class comes from across the US and Puerto Rico. 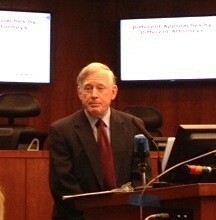 He emphasizes the importance of the Institute and the Institute’s importance to William and Mary. 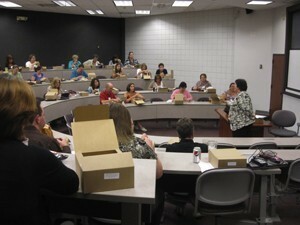 Kayla Bower, Director of the Oklahoma Disability Law Center gives an overview of ethics in special education advocacy. A most important “first” – this class is in the middle of what began years ago at this university – the concept of “citizen lawyers”. Kayla challenged the class to make ethical decisions in their advocacy. Kayla discusses how your values impact your advocacy and truth in advocacy. Jeffrey Breit, the 2008-2009 St. George Tucker Adjunct Professor of Law and partner at Breit, Drescher, & Imprevento, who provided the impetus to create the PELE Special Education Advocacy Clinic speaks to the graduates. Thank you to Professor Patty Roberts, Director of Clinical Programs and Supervisor of the PELE Special Education Advocacy Clinic for her outstanding leadership and organization for ISEA. 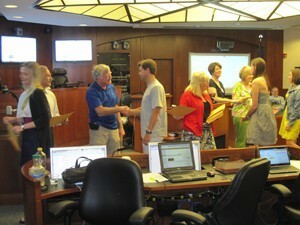 ISEA founders Kayla Bower, Patty Roberts, Pam and Pete Wright present certificates to the ISEA Class of 2012. 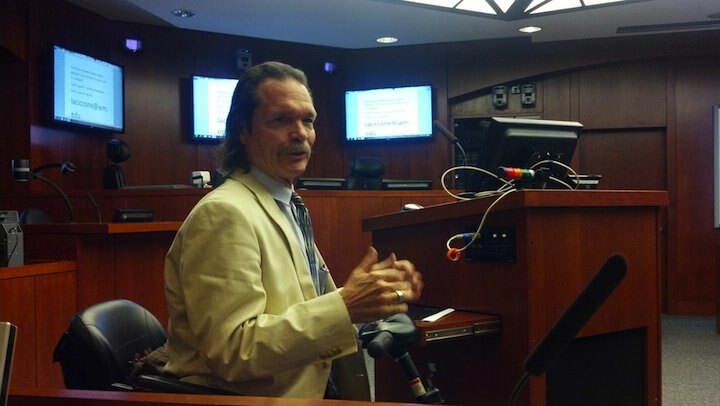 Jim Comstock-Galagan is the Executive Director of the Southern Disability Law Center (SDLC). Jim shares regulatory requirements for state complaints, resources and references, and effective strategies to use when you file a state complaint. Every state must have procedures for this – regulations only, not in the statute. State complaints cover a broad range of violations of IDEA and must contain statement that LEA violated IDEA (Part B) and all the facts re complaint. A State Complaint may be filed by any individual (organization, individual, out-of-state individual (no longer in the district), grandparent). Complaint can be filed against public agency including SEA, LEA, nonprofit public charter school, or a political subdivision of state providing education services (juvenile correctional facility). SEA remains responsible for complying with all procedural and remediation steps required in the federal regulations (34 C.F.R. 300). The SEA’s state complaint procedures must address both procedural and substantive IDEA violations. In a complaint, the district must have the data to support their decisions in cases. OSEP Commentary to 2004 IDEA Regulations, 71 Fed. Register 44601 (806). State Complaints can address both individual and systemic issues. In 2000, OSEP stated “the state complaint procedures are available for resolving any complaint…including complaints that raise systemic issues.” See OSEP Letter to Chief State School Officers, July 17, 2000 Page 4. In 2001, OSEP stated that “…an SEA is required to resolve any complaint …including a systemic complaint alleging a public agency [LEA] has failed to provide FAPE to a group of children with disabilities.” See OSEP Letter to Nann, September 21, 2001 Page 2. In 2008, OSEP stated that “states are responsible for resolving any complaint, including complaints containing allegations of a statewide, systemic nature…” See OSEP Letter to Jonathan Zimring, July 1, 2008 Page 1. OSEP Commentary to 2004 IDEA Regulations 71 Fed. Register 46601 (806). Jim discusses timelines and extended timelines for filing systemic complaints. He also emphasizes important factors in the investigation process re on-site investigation (including OSEP requirements for SEAs), ability to submit additional information, proposal from the public agency to resolve, and mediation. The SEA must issue a written decision that addresses each allegation, including findings of fact and conclusions, and reasons for its final decision. Appropriate future provision of services for all students with disabilities. 34 C.F.R. § 300.151 (b), 152(a)(5); 71 Fed. Register 46602 (8/14/2006); Letter to Copenhaver, 10/31/2008. Jim covers steps to be taken to improve your chance of success when filing a state complaint. He also provides complimentary strategies to broaden your client base and support and to strengthen your complaint. William H. Hurd is a partner in the Richmond office of Troutman Sanders and leads the firm’s Appellate Team. 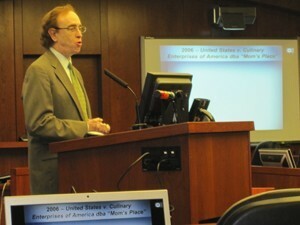 He argued the case of Schaffer v. Weast, 546 U.S. 49 (2005) (allocating burden of proof at administrative hearings) as well as several key cases in the Fourth Circuit Court of Appeals. IDEA provides the broad right to contest school system action. Section 1415(a)(6)(A). Who can bring these claims? Parents or child? Parents have their own right to enforce duties of school system under the IDEA. During due process it is always wise to consult an attorney or well-trained non-attorney advocate. 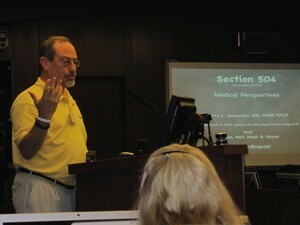 Mr. Hurd provides an overview of claims outside of IDEA (i.e., 504, ADA, Section 1983, etc.). HH v. Moffett & Chesterfield School Bd. In HH v. Moffett, an action brought under 42 U.S.C. § 1983 (2000), a disabled child and her mother alleged, that a special education teacher and a teaching assistant maliciously kept H.H. restrained in her wheelchair for hours at a time during the school day while they ignored her, verbally abused her, and schemed to deprive her of educational services. For non-IDEA claims – discussion of “exhaustion requirement”. Pat Howey is an active advocate for families who have children with disabilities. She specializes in dispute resolution. Pat is a member of the Wrightslaw Speakers Bureau. She is also a charter member and former member of the Board of the Council of Parent Attorneys and Advocates. Burning the candle at both ends makes such a bright light! Special education advocacy is what you do. It is not what you are. Rule No. 1. You cannot fix everything. Rule No. 2. You can’t change Rule No. 1. Rule No. 3. Your client’s emergency is NOT your emergency. Rule No. 4. Recharge your batteries often. Rule No. 5. Establish regular business hours. How many hours do you have to devote? Full time/part time? Set business goals and objectives. Base your goals and objectives on your identified Present Levels. Reassess your goals frequently and change them as needed. Who else have you talked to? Are you already working with an attorney or advocate? The parent who wants you to do everything for him/her. Provide a referral list of attorneys and advocates. Do not promise to find an attorney. Do not pour gasoline on an existing fire. Maybe YOU are the one who can prevent or stop a wildfire! Promise only what you know you can deliver. When should you terminate a client? Sooner rather than later. When should you involve an attorney? Sooner rather than later. How to deal with intimidation. Show Me the Data! Using Evaluations, Tests and Measures as Evidence by Mark Kamleiter Esq. 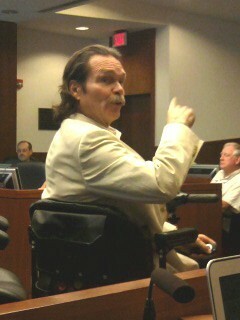 Mark Kamleiter represents children with disabilities in due process and in Federal Court, advocating for an appropriate education in public school systems. Evaluations are central to educational advocacy and in due process litigation. Evaluations provide the scientific evidence needed to establish the existence and nature of educational disabilities. Periodic evaluations establish baselines and measure progress or lack of progress. Evaluations are the tools and language of the experts who will testify in due process and civil litigation. 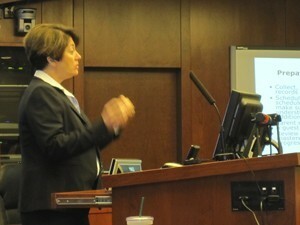 “Failure to Identify” is a common issue in special education litigation. If the district fails to identify a child with a disability, the district may have to provide compensatory education or reimbursement for a private placement. However, this assumes that the parents gave appropriate notice that meets legal requirements. If a parent, teacher, or other person suspects that a child may have a disability and makes a written request for an evaluation, the district has an obligation to perform the appropriate evaluations within a specific time frame that differs from state to state. If the parent wants an evaluation, they need to submit a written statement that they suspect the child has a disability and are requesting an evaluation. This request evokes the district’s positive obligation to evaluate the child for a disability. Parents should submit their request in writing to the school. They should say that they believe their child may have a disability and are requesting an evaluation. This request evokes the district’s positive obligation to evaluate the child for a disability. Because schools often ignore parental requests, the parent, advocate or parent attorney will need to be proactive to ensure that the school completes evaluations. All communications with the school need to be in writing. If you suspect that a child may have a disability, describe your concerns to support your request for an appropriate evaluation. State that this letter is your consent for evaluation. If the school has a “Consent for Evaluation” form, ask the school to send it immediately. The timeline for performing an evaluation does not begin until the school receives the parental consent for evaluation. The IDEA includes a “child find” obligation that requires school districts to locate, identify, and evaluate children who are suspected of having a disability. Teachers often miss the children who have learning disabilities, ADHD, and even autism. Under IDEA, the school district has sixty (60) days from the date the parent signs consent to conduct the evaluation unless the state has a different timeline. You need to get a copy of your state special education regulations to determine the timeline in your state. Today, on the 22nd birthday of the ADA, we enjoyed lunch with Marilyn Bartlett, a member of the ISEA Class of 2012. 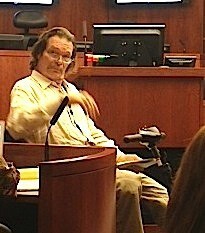 Mark Kamleiter represents children with disabilities in due process and in Federal Court, advocating for an appropriate education in public school systems. Mark also serves as a director on several organizations including the board of the Council of Parent Attorneys and Advocates, Inc. (COPAA) and is a frequent speaker on issues related to the education of children with disabilities. 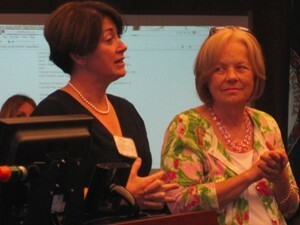 Pat Howey has been involved in special education advocacy since 1985. 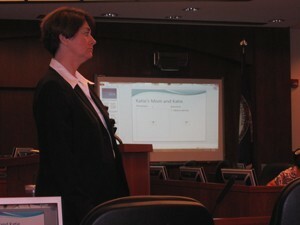 She is an active advocate for families who have children with disabilities and specializes in dispute resolution. Pat is a member of the Wrightslaw Speakers Bureau and a charter member and former member of the Board of the Council of Parent Attorneys and Advocates. This training is NOT about teaching advocates how to represent parents in due process! In a minority of states, advocates may conduct a hearing as “Qualified Representatives.” Lay advocate Lilly Rangel-Diaz of Florida has a win rate higher than some attorneys. She is generally aided by an attorney. 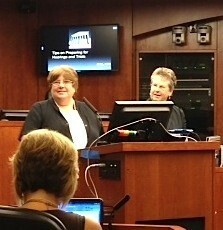 This training is NOT a comprehensive training for attorneys on how to prepare for hearings. Read the law, over and over again. The law is like a flowing river, it is not static. Each new case will have different facts and different issues. Each time you reread the law, you will learn something new. Be honest! Tell your level of training, experience, education, etc. Advocate v. Attorney – BAD! When parents do have an attorney, advocates need to work with, not against the attorney. It is NOT your responsibility to tell the parent that their attorney is inexperienced or incompetent. 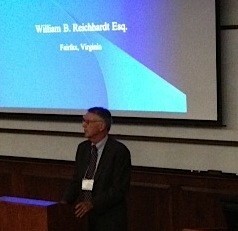 William B. Reichhardt (Bill) is the principal in the firm of William B. Reichhardt & Associates in Fairfax, Virginia. His primary practice areas include juvenile law, criminal defense, school law, special education, mental health issues and family law. He is the 2010 recipient of the Lewis F. Powell Jr. Pro Bono Award bestowed by the Virginia State Bar in recognition of his efforts to provide and support legal advocacy for children. Dr. Harry Gewanteris a pediatrician and pediatric rheumatologist who has practiced in Richmond, Virginia for almost 3 decades. Over the years, his practice has evolved into primarily caring for children and youth with disabilities and special health care needs. Since three of his four children had IEP’s, he lived through the many challenges parents and children with disabilities or chronic health problems face within the public school system. These experiences have resulted in a desire to help other families undergo fewer difficulties than those of his children and family. Mr Reichhardt and Dr. Gewanter discuss issues related to experts in different field, when you need experts, how to use information from experts. Question: When do you need experts? Take a typical eligibility case of child with ADHD who is making passing grades. School says not eligible for services because he makes passing grades. Doctors get 99% of their information from parents and especially from children. We encourage doctors to ask questions about how the child is functioning at school and in the community, and to learn educator language – that is much different from medical language. Have the parents go the state DOE website, get the eligibility form. On the form is information that tells you what the team is looking for – the doctor needs to describe the disability & diagnosis in educational terms. That’s the operative language. There are neurological conditions that manifest in children that are not easy to describe. If a child has neurological condition, unlikely to be in typical school evaluation. The child needs a neuro-psych evaluation. There are ways to describe or operationalize the impact of a disability on a child’s ability to function in different areas. What are the child’s deficits? How do these problems affect child’s ability to function in school? What does the child need to deal with the problem in school? I get the family to make a list, bring it to me, we talk about it. Part of advocacy is objective, correct analysis of the evidence. This is very very important as we talk about using experts. Think of a meeting with experts as a problem solving session. As an advocate, think of your role as defining expectations as problem solving sessions. Now assume we have experts involved and talking to school people. 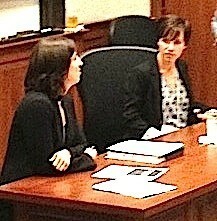 You cannot resolve a diagnostic dispute unless you frame the question correctly. We are not in complete agreement but are making progress. What do we agree on? We all agree on the data showing that Johnny is distractible. We can stipulate that he shows distractibility in the educational environment. There may be other areas where we agree and can stipulate. Is there a diagnostic disconnect? Use your experts to deal with the diagnostic disagreement. We need help to resolve this issue. Will school agree to an IEE to resolve these questions? Due Process is litigation. Parents are at a disadvantage in due process? Absolutely. In using experts, have to identify the experts. Experts have to render clear opinion on the issue. Make the decision-maker want to rule in your favor. Short presentations by four attorneys, followed by Q & A.
Jim Comstock-Galagan is the Executive Director of the Southern Disability Law Center (SDLC), New Orleans, LA. Mediation is available before and after a party requests due process. Resolution sessions are required after a due process complaint is filed. Parties may request mediation even if they do not file a due process complaint. 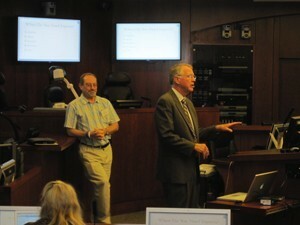 Jim discussed mediation requirements as well as issues of confidentiality and costs. However, it is difficult to mediate a portion of FAPE. All FAPE, not a portion, is required. So, for the right case, mediation may work really well in some circumstances. The state is responsible for the costs of mediation. The Mediation Agreement is enforceable in state or district court. ” If parties choose not to use the mediation process, the SEA or LEA may choose to offer an opportunity for parents and schools to meet with a disinterested party who will explain the benefits of and encourage the use of the mediation process to the parents.” The state is also responsible for this cost. Parents must file a due process complaint within two years. (6) a proposed resolution of the problem to the extent known and available to the parent or school district at the time. You cannot get Resolution session if you have not filed for Due Process. The school may not bring an attorney to the meeting unless the parent is accompanied by an attorney. Unlike mediation sessions, discussions during resolution sessions are not required to remain confidential. Jim shares his own story to explain how his personal experience shapes who he is today. If you want people to understand the matter of inclusion, you make them understand it for themselves – how it would relate to them. Jim understood when his mother first walked him to elementary school. He was told he could not attend – he needed to go across town to the “crippled children’s school.” Jim’s mother said, “I’m telling you, he is NOT going to crippled children’s school.” Inclusion mattered to Jim’s family. Jim knew he was not going to the crippled children’s school – the only school he knew he would attend, was college. So his family adjusted so he could attend a Catholic school nearby. “Why can I not go to school with my brothers?” Jim wondered. He was sad. So his family adjusted again, in order to allow all the brothers to go to the same Catholic school. “Every step toward the goal of justice requires sacrifice, suffering and struggle.” Dr. Martin Luther King. “belonging, value, acceptance, happy…” This is what children feel when they are included. “rejected, hurts in the pit of your stomach, inadequate, devastating, abandoned, unsupported, resentment…” What does this feel like for kids who are excluded? How do kids feel when they are stuck in the trailer, in the room down the hall, when they are segregated from others? What do the other kids say about these kids? “We never see them.” We need to be aware of how we are educating kids, kids with and those without disabilities. Doesn’t everyone have human limitations? We all need and have accommodations. Accommodations are the DNA of community life. We all need accommodations to be included. Things are only perfectly good for people with disabilities when they are perfectly good for everyone else. Schools use 17-20 accommodations in classrooms so that teachers (like Jim’s wife) can teach. What happens when the school is asked to provide several accommodations for a child with disabilities? Part of being a good advocate is to create the connection between a child, the principal, the school attorney, the IEP Team. Make people see these issues in ways that would “not be OK” for them. Passion and emotion count! No one should be comfortable when they propose to segregate a kid. Inclusion matters to everyone. 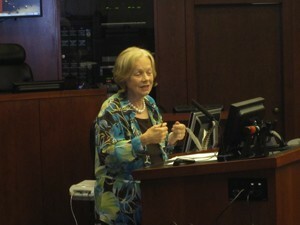 Emily teaches in the Health Law Partnership (HelP) Legal Services Clinic at Georgia State University’s College of Law. 9. Know the Law. And Bring it With You. Figure out any “unique” issues. 7. Know Whom the School Attorney Represents. Build a better relationship with the school attorney. 6. No Surprises. Give the School a Chane to Do the Right Thing. (Don’t “hide the ball” – let the school know what you want, in writing. Know the Letter to the Stranger format). 5. Prepare, Prepare, Prepare. Know and understand your documentation. Know any forms involved. If any issues can be resolved before the meeting, take care of these early. 4. Be Realistic and Open-Minded. Realistic and achievable goals, yet specific and measurable. 3. (You) Give Prior Written Notice. Put it in writing. Create your own clear, written, record with a parent (advocate) attachment to the IEP. 2. “Suing” is the Last Resort. 1. Leave the Gun (at home). Take the Cannoli. Know what is in the school’s best interest to negotiate effectively. Enjoying lunch today with Mrs. Pat Haymes, Office of Dispute Resolution, VA Department of Education. Ms. Haymes shares information about IDEA, NCLB and ESEA and covers topics such as reading, eligibility, student progress, receiving FAPE, looking ahead to future years in education. Because we don’t know what ESEA will look like, we are not sure about what the re-authorization of IDEA will look like. Whatever changes are to come, if we continue to focus on the kids, we will overcome these challenges. A presentation and open Question and Answer session with this panel is underway. 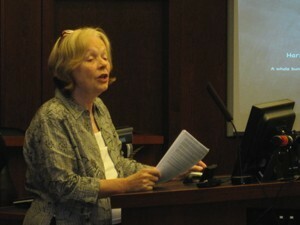 Professor Patty Roberts introduces the Panel. Ethics, standards of conduct and moral judgement, is the most challenging part of decision making. 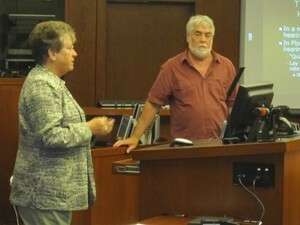 The special education advocacy taught at ISEA could best be described as legally-based advocacy. Ethics issues are not always finely drawn for special education advocates. If you are in the process of developing a profession (special ed advocacy) ethics are important for the well being of the public – as well as the advocates well being. The problem is identifying the ethics and obtaining a commitment to follow those ethical rules. Legally-based advocates are most like the existing paralegal profession. There are no universally recognized ethical standards specifically tailored to special education advocates. Kayla presented nationally recognized sources of core beliefs and guidance on Ethics Code. A special education advocate shall achieve and maintain a high level of competence. A special education advocate shall maintain a high level of personal and professional integrity. A special education advocate shall maintain a high standard of professional conduct. A special education advocate shall serve the public interest by contributing to the improvement of the special education system and delivery of special education services, including pro bono publico services. A special education advocate shall preserve all confidential information provided by the client or acquired from other sources before, during and after the course of the professional relationship. A special education advocate shall avoid conflicts of interest and shall disclose any possible conflict to the employer or client, as well as to the prospective employers or clients. A special education advocate’s title shall be fully disclosed. A special education advocate shall not engage in the unauthorized practice of law. “Core beliefs influence the approaches of the special education advocate on substantive issue. The advocate should strive to identify these core beliefs and then share them openly with families and students they assist. 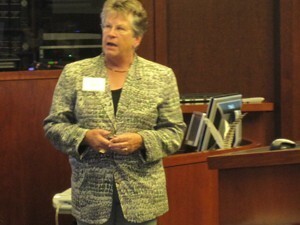 Professor Patty Roberts conducts a session: Negotiating with the school – Getting to YES. Professor Roberts will work with the mock IEP Team and the school to attempt to design a program for Katie, a fourth grader who has Athetoid CP which causes combination of tightness and looseness in muscle tone. Katie specifically needs help at lunch – her food should be pureed and she needs help to eat. This mornings role play exercise is to generate thoughts/discussion about individual IEP team members, their position and their interests. How do these positions/interest impact IEP team decisions? Is there objective criteria available to support these positions? Are all required protocols being followed? Action Ideas for resolution – must have your best alternative for reaching agreement to resolve the problem. 1. Katie’s Mom- describes Katie, who she is, her personality, hopes for the future. Also tells us why the IEP meeting was requested, Katie’s needs and challenges, what program and services she thinks Katie needs. The main concern is providing an appropriate lunch time for Katie – preparation of appropriate food and assisting Katie to eat. The class discusses Katie’s needs and services that might be required in her IEP to meet these needs. 2. 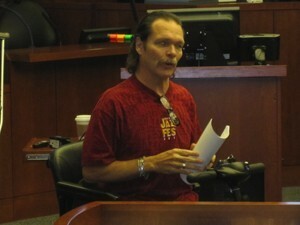 Katie’s attorney presents his position as he represents Katie. The class continues to discuss Katie’s needs for appropriate supports and services, LRE, accommodations, social and emotional needs, etc. What about appropriate training for school personnel, cafeteria, transport, etc. who are involved with Katie. Another attorney (or involved professional) interest: timely resolution. What about attorney fees? Professional egos? Can’t Katie eat the regular lunch? Maybe the school could provide a part time aide, but not full time. OT could maybe train the aide. But OT services not available. Class discusses what are reasonable accommodations. Concerns about why the school takes the position it did. Where would Katie eat – actually? There was no position of the Sped Director about where Katie would eat, her safety while eating, and emergency plan. Sped director seems to think this is not her issue – more a central office issue (or a specific building issue). 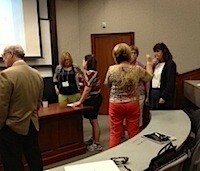 The class discusses the lack of attempt at compliance, collaboration. 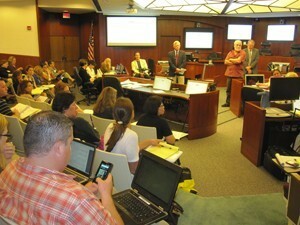 Is the Sped Director overwhelmed by requests, needs of all students, fatigue factor involved. Perhaps didn’t realize this request fit in her realm – was not really academic, social, etc. 4. Special Ed Teacher: has always wanted Katie mainstreamed, found Katie very academically capable. No reason that Katie cannot be in an inclusion setting. Believes LRE is regular ed class with accommodations. Opposed to her coming back to self contained class. Already overwhelmed, many aides quit because of work load. Will attend and add input at IEP meeting. Willing to train someone to puree Katie’s food. 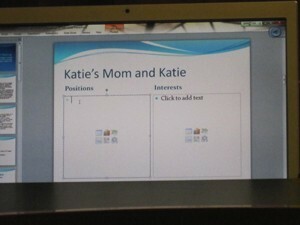 Expresses interest in focusing on others in her class who need her – and finding the most appropriate setting for Katie. 5. Regular Ed Teacher: concerned about Katie’s safety in her classroom. Suppose she chokes? Who is liable? What about food at class activities and parties. Will she be responsible for pureeing all this food? Time and staff constraints. Class is concerned about lack of knowledge or training to work with Katie. This training needs to be provided for Katie to make progress in this classroom. Class discussion notes that the focus of the “mock” school personnel seems to be on Katie’s challenges rather than her strengths – what’s best for Katie. 5. Katie’s Aide: Katie does a great job, has great potential. I assist her in cafeteria, classroom, throughout the day. Afraid lack of appropriate accommodations will get in the way of Katie’s progress in the general ed curriculum. Her main interest seems to Katie the person – not Katie the disability. 6. OT: did not attend meeting. Gives her report to the Principal. 7. Principal: Provides a report from the OT. OT feels Katie would be better in self contained class. Principal feels they are currently meeting Katie’s needs as required. Professor Fred Lederer describes for us the video and technological capabilities of the world’s most technologically advanced courtroom. 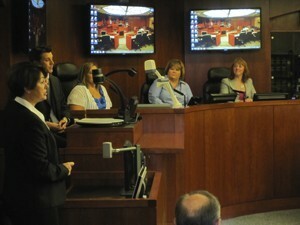 The McGlothlin Court Room, where ISEA 2012 meets, has the most assistive technology installed in a courtroom at one time. 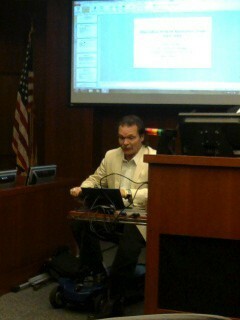 Professor Lederer is demonstrating the assistive technology available in the courtroom. He takes us through the experimental trial in 2006 – the Lab Trial. This trial was designed to demonstrate what could be done with techology to assist people with hearing, seeing, moving while in a courtroom. This includes the use of wheel chair lifts, Segway, a wide range of audio and video technology for individuals with special needs. From the latest hardware to cutting edge software, the McGlothlin Courtroom serves as a testing bed for the latest advancements in courtroom and legal technology. 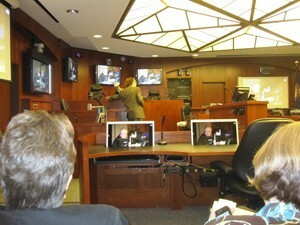 The Courtroom is equipped for videoconferencing and employs the latest generation of court reporting technology, including the ability to publish real-time transcription to the Internet. 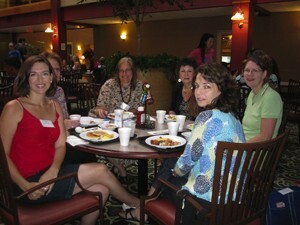 Networking starts early at ISEA as class members from different states breakfast together. 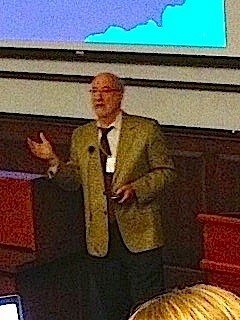 Advocating for Children with Disabilities in the Juvenile Justice System by William B. Reichhardt Esq. In 2009-10, 75% of all short term suspensions were for minor acts of misconduct- i.e. – disrespect/ obscene language or gestures. The Washington Post recently reported that in the Washington Metropolitan Area, African American students are suspended or expelled at a rate 3-4, and Hispanic Students 2 times that of White Students. – this seems to track national statistics. Nationally, Special Education Students are subject to suspensions and expulsions at twice the rate of general education students. – for the 2009-10 school year, Fairfax County Public Schools reported that 43% of over 700 students recommended for expulsion were special education students. 54 % of children admitted to Juvenile Correctional Facilities had identified mental health disorders other than ADD or substance abuse. More than half of children admitted to the Reception and Diagnostic Center had identified learning deficits. Why? Many people believe “We need to take the kid to court to get him help.” If the child is convicted, the Court can order services. This is where an advocate who knows special ed can be very helpful – talk to the juvenile probation officers, defense counsel, prosecutor. Main Concerns: The welfare of the child and family, the safety of the community, rehabilitation of the juvenile and the protection of the rights of victims. Referred by the school for truancy or other “status” violations. Charged with a criminal violation for a school based offense – for which there is also school discipline. All children charged in the Juvenile Court are entitled to a competent, thorough and vigorous defense. This should not be compromised for the purposes of seeking “help or services for the child”. There is no conflict between due process and the best interests of children. Severe thunderstorm, power flickering. Session will resume later. 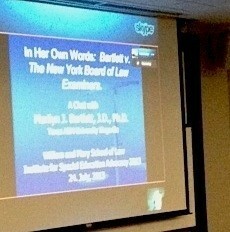 Discipline of Children with Special Needs by William B. Reichhardt, Esq. Our starting point are children who have been identified as having a disability under IDEA or Section 504. Students who have not yet been determined eligible under IDEA prior to the misconduct may invoke the procedural and due process protections if it is later determined that they were eligible at the time.of the misconduct. The parent has expressed written concern that the child may need special education services. The school notes pattern of behavior or performance that indicates a need for special education services. The parent has requested an evaluation for eligibility for special education services. To be an effective advocate, you must be credible, intelligent, and .. To me, this is the essence of effective advocacy. Short term suspension – up to 10 consecutive school days or 10 cumulative school days in a year. Long term suspension – more than 10 consecutive school days. A special education student can be removed to an appropriate interim alternative educational setting for not more than 10 consecutive days without this removal being considered a change of placement. Be aware of patterns of short-term removals that act as placement changes. May be called something different – a placement that is not his placement in the IEP. This is an area of law that continues to cause confusion. Some schools believe they don’t need to provide any instruction while the child is suspended or expelled. Or schools believe that because he’s suspended, they can change placement. What is a Change of Placement? Series of removals total more than 10 school days in the school year. The child’s behavior is substantially similar to previous incidents of removal. Consider total amount of time/proximity of removals. If the child is faced with expulsion or long term suspension (over 10 days), the school must determine whether the behavior is a manifestation of the child’s disability. – The student is in possession of a weapon at school, on school premises or at a school activity. – The student knowingly possesses, uses, sells or distributes illegal drugs while at school or school functions. – The student has inflicted serious bodily injury on another person at school or on school premises. The behavior was the direct result of the schools failure to implement the IEP. If a BIP has already been developed, review the plan and modify as needed. If the behavior was not a manifestation of the students disability, the student is subject to the same discipline for misconduct is children without a disability – however, the student must continue to receive education services to allow the child to progress under the IEP. * * We are taking a short (5 minute) break, then Bill will wrap up the presentation on discipline and begin with juvenile justice. Stand by! Quickly obtain the discipline packet from the school – incident report, student’s statement, witness statements, teacher summaries etc. (ask about video tape). Have a thorough understanding of the nature and scope of the student’s disability. See how the school has previously described the manifestation of the student’s disability- in the IEP, FBA, BIP. Objectively assess the defense of the MDR. Do not stretch credibility. Experts such as a child’s therapist or physician should have a clear understanding of the criteria for the MDR. Give experts a copy of the incident report and student statement(s). In giving written or verbal input, expert should reference specific facts of the incident and link to the child’s disability using the MDR criteria. If you need more time to gather existing relevant evidence, offer to do a written waiver of the 10 day rule. If refused, offer the waiver in writing and cite the reason. This could help you on appeal. If your experts are helpful, get releases for them to speak to the school about the MDR criteria, in addition to written submissions. Should be written and should describe specific positive behavioral interventions. Are used to help a student with behavioral problems function in the least restrictive environment. Should be made part of the student’s IEP (but not required). School may request if child dangerous in current setting. Denial of FAPE by extended homebound exclusion without adequate services. Behavior and discipline are complex subjects. Attorney Mark Kamleiter has just begun to discuss this complex topics. 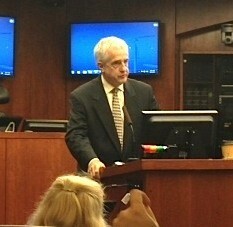 Mark is founder and owner of Special Education Law and Advocacy, a special education law firm in FL. 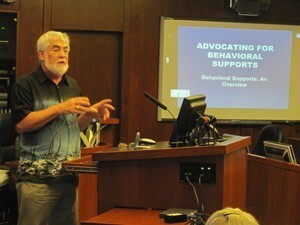 He is President of STAND (Statewide Advocacy Network on Disabilities). We’ll continue to post the details. Evaluations: You Need to Be Proactive. There are excellent interventions to keep the child from reaching that point. 1. Behavior problems ultimately harm the child and interfere with access to learning. 2. Behavior problems, if left unaddressed, are generally perceived and treated by school personnel as intentional misconduct, requiring punitive measures. 3. It is true that, left to their own devices, most schools’ idea of behavior evaluation is a list of the “bad” behaviors the child engages in, with some record of frequency. 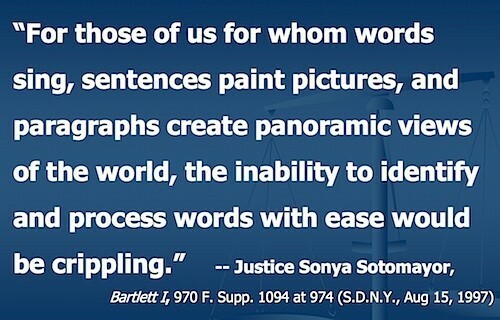 This is why it is vital that the advocate insist upon a more professional, informative assessment, that also explores the function of the behavior. 4. A good positive behavior support plan can have the effect of turning the school from reflexive punitive measures, by providing a well thought-out hierarchy of behavior management tools. The law (34 CFR Sec. 104.35) does not require a functional behavior assessment until the school is considering expulsion or suspension beyond ten accumulated days. This is such a vital evaluative tool that I request this assessment as soon as I perceive a significant behavioral problem. It is better to prevent a regrettable behavioral incident, than try to use the evaluation to defend a behaviorally disordered child after he has committed some serious offense. Nature of the Assessment: Examines the function of a child’s behavior. In other words the evaluator examines the child’s behavior to determine why the child is acting the way he/she is. The evaluation also attempts to determine if the behavior is a “manifestation” of the disability, or is independent of the disability. Concept: Behavior is motivated by a need. The behavior serves the child in some way. If we can determine what the behavior is doing for the child, we can successfully plan a way to deal with the behavior. This approach focuses upon the interaction of the behavior with the child, rather than focuses on the behavior itself. This allows for an individualized, focused approach. Basic elements of a good BIP. a. Behavior description. Describe target so that a person who does not know the child would recognize it. A baseline of the behavior must be defined, followed by data collection, to measure progress (or lack of progress). 3. Prevention of target behavior. 4. Occurrence of target behavior. 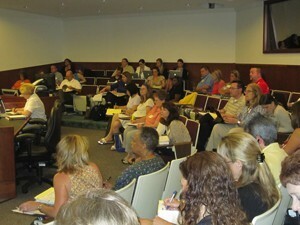 This class of 47 students returns from the morning break, ready to learn about Section 504. Kayla Bower, executive director and senior litigation attorney for the Oklahoma Disability Law Center, opens the next session with an overview of the importance of Section 504. Kayla introduces Dr. Harry Gewanter, pediatrician and pediatric rheumatologist who will discuss using Section 504 to advocate for children. 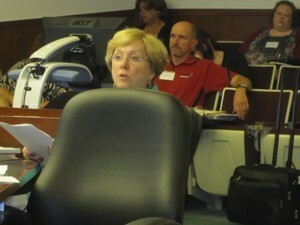 Kayla Bower asked if the participants had a copy of the ADAA: Additional Guidance from OCR. “I view 504 plans no differently than safety nets under tightrope walkers or fire drills. This is essentially disaster planning. You may never need it, but you want a plan in place, just in case your child needs it. Dr. Gewanter showed the class several sample letters he uses for different purposes. In the 504 support letter, Dr. Gewanter wrote to request 2 sets of books, to limit distance child had to travel, that child needed to be allowed to stand, stretch, and move around. She also needed extra time for tests and homework. “She may have an increased number of absences, tardies, and/or early dismissals as a result of her chronic illness and/or appointments, request that she be granted dispensation from official attendance policy if necessary. This child is receiving medication that increases the risk of infections. The school needs to notify family if she is exposed to potentially serious illnesses. “All staff involved with Mary need to regularly remind themselves and others of these issues, especially since she will appear well most of the time. I’m here to help you so please contact me if you have questions or concerns. 9:50 am. 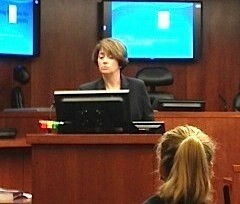 Professor Patty Roberts is up. 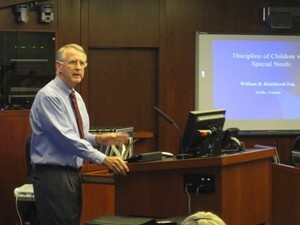 Professor Roberts described the purposes of IDEA and governing principles of the law — FAPE, LRE, and meaningful parental participation. She described sources of law = federal statutes, federal regulations, judicial decisions, state regulations, and Guidance documents from state and federal departments of education. “It’s important to understand what is possible for the school to do, and what is reasonable for the child to do. You need to use principled negotiation strategies, and recognize underlying interests, not just stated positions. Professor Roberts provided practical strategies to prepare for IEP meetings, discussed the importance of parental participation, the strengths of the child, the parent’s concerns for enhancing their child’s education and offered suggestions for effective parent involvement. She described the required components of the IEP – present levels of performance, measurable annual goals, special education and related services, assistive technology, accommodations and modifications. She also described components that IEPs need to include – behavioral intervention plans, related services, supplementary aides and services, and transition services. Professor Roberts moved on to educational placement – how placement should be determined and that placement needs to meet the child’s unique needs. To the maximum extent appropriate, children with disabilities are to be educated with children who are not disabled – the least restrictive environment. 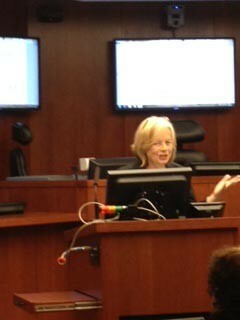 Next, she described issues related to implementation and revision of IEP, and why monitoring progress is so important. 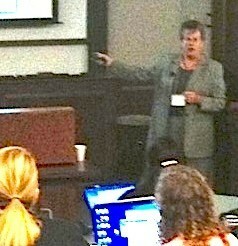 IEPs with Pete Wright, Esq. 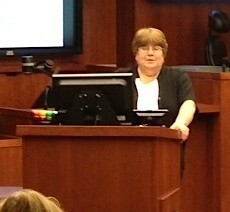 and Patricia Roberts, Esq., William & Mary Law School Special Education Advocacy Clinic. Pete began by reviewing the statute about Individualized Educational Programs, as amended in IDEA 2004, and had participants highlight key portions of statute in their textbooks. 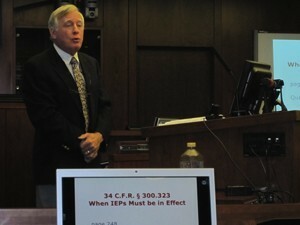 He noted that the IEP statute is convoluted and difficult to follow. The special education regulations are organized more logically, so he used the regulations to describe the legal requirements of IEPs. Pete also discussed the regulations that govern special education for military children with disabilities. He recommended that advocates who work with military children download “Provision of Early Intervention and Special Education Services to Eligible DoD Dependents” (DoD Instruction 1342.12). For example, when families relocate to a base in a different state, their children with disabilities are entitled to a comparable IEP. 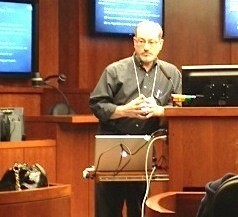 Pete described the Commentary to the IDEA regulations [https://www.wrightslaw.com/idea/commentary.htm ] and gave examples of ways that advocates can use the Commentary in their work. Pete described SMART IEPs – IEPs that are specific, measurable, use action words, realistic and relevant, and time-limited. This entry was posted in Institute of Special Education Advocacy ISEA and tagged ISEA, W&M Institute of Special Education Advocacy by Wrightslaw. Bookmark the permalink.